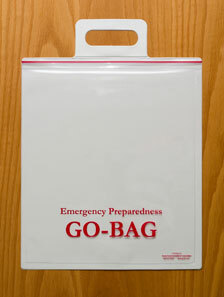 The Go-Bag is an ideal solution for educators to store the basic necessities for an evacuation. The bags are 12 3/4" wide by 15" high; large enough to store class rosters, emergency guides, basic first aid supplies, emergency lights, ropes to use during evacuation and other basic supplies, without being bulky. The handle is reinforced for added strength and comfort; the bags are designed to hold up to 3 pounds of content. They have a large zipper closure which allows for easy access and keeps contents safe and dry.